It is a pleasure to have been invited to speak this evening when we are here for the launch of Patricia Byrne’s new book, The Preacher and the Prelate, about Canon Edward Nangle, the controversial founder of the Achill Mission. Patricia and I met many years ago in Achill, where we both took part in the Annual Heinrich Böll Memorial Weekends. I was invited to speak in successive years on a range of topics that included the contribution to theology of the Limerick-educated poet, John F Deane, TS Eliot’s Irish connections, and, of course, Edward Nangle. I first visited Achill in 1974, and ever since I have been a regular visitor to the island. 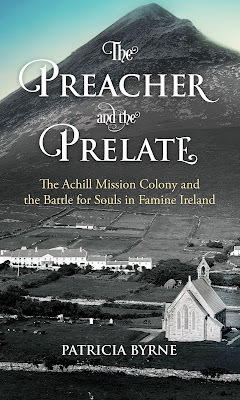 These visits spurred my interest in Edward Nangle and the Achill Mission. I imagine the organisers of these weekends knew my views on Achill were likely to stir emotions and spark controversy. And in the opening pages of this book, Patricia, without naming – or blaming – me, catches the fire and tempest that raged in one pub after my slightly more benign – or at least understanding – assessment of Nangle. In this book, Patricia captures in a very careful way the ugly polemics of what passed for theological debates in the 19th century. Edward Nangle is a complex character, and much of that complexity is explained by his complex and mainly Catholic, background. The Nangle family of Kildalkey, near Athboy, Co Meath, was a strongly Catholic ‘Anglo-Norman’ or ‘Old English’ family from Co Meath, inter-married for generations with similar Catholic families with names like Preston, Cusack, Carney, Drumgoole, FitzSymon, Plunket, Dillon, and Caulfield. An earlier family member, Edward Nangle of Cloondara, Co Longford, began to have hallucinations in 1660 which a local Catholic priest, Father Patrick Keenan, claimed were visions of the Virgin Mary, Saint Patrick and the Trinity. Nangle reverted to Catholicism, led a Catholic rebellion, and was killed four months later. Later, he was revered by some Catholics as a saint and martyr. Edward Nangle’s father, Captain Walter Nangle, was married three times. His first wife, Jane Callan, was a sister-in-law of John Esmonde, a leading United Irishman who was hanged on Carlisle Bridge (now O’Connell Bridge), Dublin, in 1798. Walter and Jane were the parents of six children, and I have traced the baptisms of three of these, all in Catholic churches in Dublin: Bartholomew Nangle (1779-1841) in Saint Mary’s Pro-Cathedral (1779); Walter Nangle in Saint Michan’s (1780), and Mary Ellinor Nangle also in the Pro-Cathedral (1782). It was only with his second marriage in 1790 to Catherine Anne Sall that Walter Nangle conformed, at least nominally, to the Church of Ireland. So, apart from a large first family of Catholics, Walter Nangle had eight more children, three who survived and were brought up as Protestants, including Canon Edward Nangle (1800-1883). Yet one of these three surviving children, George Nangle (1791-1871), had a daughter, Lucy Elizabeth Nangle (1824-1887), who was born in France, became a nun and died in a convent in Newhall. She was Edward Nangle’s contemporary and first cousin, and he most have been aware of her throughout his life. Walter Nangle’s third wife Elizabeth (married 1813), the daughter of William Toole of Kilkock, Co Kildare, also came from an ‘Old Catholic’ family. Edward Nangle was born in 1800, probably on 25 November, and was baptised in Saint George’s Church, Dublin, on 14 December 1800. It was customary at the time, when there was a Catholic father and a Protestant mother, that the sons were brought up as Catholics and the daughters as Protestants. Why then did Walter Nangle decide that the sons of his second marriage should have a Protestant education? Perhaps so that young Edward could go to Cavan Royal School. It was a life-changing education, and his contemporaries in Cavan included Thomas Fowell Buxton, the great 19th century Liberal campaigner against slavery, and Robert Daly, the celebrated evangelical Bishop of Cashel. Perhaps it was a cultured education, for later he played the violin, painted in watercolours, and admired Byron’s poetry. On his own admission, Nangle was a wild and reckless student at Trinity College Dublin. But he was showed early symptoms of anxiety and depression. After ordination his first experiences as a curate where extremely short: a few months in Athboy, Co Meath, and a mere fortnight in Monkstown, Co Dublin. When he moved to Arva, Co Cavan, he had what we would now recognise as a breakdown. Perhaps Nangle could never come to terms with the conflicts and tensions in his background and was constantly plagued with a crisis of identity. Even his biographer, Seddall, and his bishop, Plunket conceded that Nagle could be too strong in his language and his choice of phrase. Seddall conceded that Nangle’s language was ‘undoubtedly strong’ and he admits that Nagle was ‘a firebrand, a fanatic and a disturber of the peace.’ In defence of Nangle, it must be said that many of the most bigoted views ascribed to him are not his but those of Seddall, interwoven in his biography without citation or references. His defenders claim Nangle rescued the Irish language from extinction in Achill; his critics say he used the Irish language as a clever ploy to beguile naive peasants. The principle foundation for allegations of ‘souperism’ against Nangle and the Achill mission arise from the visit of the Halls to Achill in 1842, and their subsequent report. So, what was Nangle’s legacy when he left Achill in 1852? There are some areas in which Nangle had a lasting and positive influence. 1. Catholic life on the island: It is ironic that one of the interesting consequences of the Achill Mission was the reinvigoration of Catholic life on the island. Before Nangle’s arrival, there were two priests on the island and one small church near Kildavnet. Without Nangle’s presence, it is unlikely that Archbishop MacHale would have sent Italian missionaries to the island or Franciscans to Bunacurry. 2. Land reform: When the Achill mission bought out the leases when the O’Donel estate collapsed after the Famine, tenant farmers were given viable holdings, crop rotation was introduced, and many of the poorest tenants were given new holdings. 3. Tourism: The mission drew attention to the island, and created tourism in Achill. Soon, Achill was on the itinerary of every fashionable tourist in the west of Ireland. The Achill Mission Hotel, later the Slievemore Hotel, was built in 1839, hotels were soon built at the Sound and in Newport, and railway line was extended west. 4. Health Care: Dr Neason Adams first came to Achill because of an outbreak of cholera as well as famine. The health care provided this ‘Saint Luke of Achill’ has never been criticised. A small hospital and dispensary offered care to all without question. 5. The infrastructures: When Nangle arrived in 1831, Achill had few roads and no pier, so that in a famine year when there was a bumper catch of fish it could have been greater, but boats had to land their catch on the strand at Dugort. The mission built the first pier at Dugort and the first courthouse at Achill Sound. 6. Employment and population: The mission, agricultural reform, building work, roads, piers, tourism all helped develop Achill’s economy, and ensured that emigration did not hit Achill as badly in the 19th century as it might have had without the mission. Ironically, due to stalling Catholic migration, there are, proportionately speaking, more Catholics living on Achill today than Nangle might have anticipated. In saying things like this, I never realised I would encounter bitter memories of Nangle and the Achill Mission on that rain-filled summer Sunday, nor that memories of it would be captured so vividly in this book this evening. Nor did I realise that weekend that I was going to find myself working in parish ministry in Limerick, or that I might find myself here this evening. I have read this book, I have enjoyed this book, I am not always going to agree with every aspect and approach the author takes in its book. And that’s good, because we can never hope to understand our shared history without debate that can is both robust and argumentative, and yet remains friendly and humorous. And so, in friendship and in humour, I recommend not only that you buy this book, The Preacher and the Prelate, but that you read it and join this debate too. I attended the graduation Mass yesterday afternoon [23 May 2018] for Coláiste Mhuire in Askeaton, where I am a member of the Board of Management, and later in the evening I was at the Graduation Ceremony for the Class of 2018 in Coláiste na Trócaire, Rathkeale, where I was a special guest with Father Liam Enright. 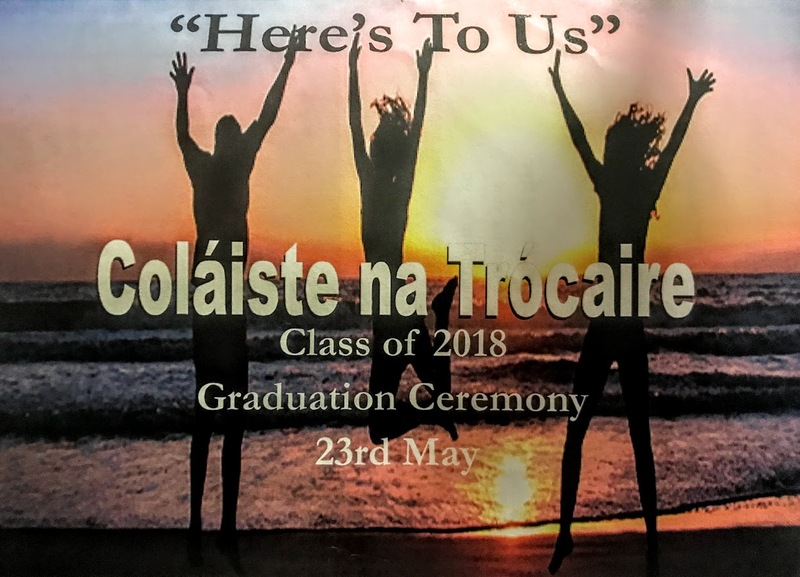 I was asked to speak twice at the Graduation Ceremony in Rathkeale, and to join with Father Liam in pronouncing the blessing at the end. That just because someone doesn’t love you the way you want them to doesn’t mean that they don’t love you with all you have.